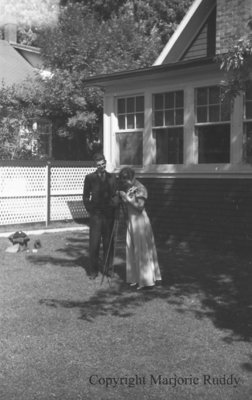 Black and white negative of Douglas Astley and Louise Coleman standing outside. Mr. Astley is wearing a suit and Ms. Coleman is wearing a long gown with a corsage pinned on the gown by her shoulder. In this view Mr. Astley is standing back and watching Ms. Coleman look into a camera. Douglas Astley & Louise Coleman, 1941, Marjorie Ruddy. Whitby Archives A2013_040_915D.